Amidst the sprawling Rann of Kutch, the bustling Industrial belt of Ahmadabad, the administrative hub of Gandhi nagar and the Long coastal line of one of the most culturally vibrant states of India, lies the saga of fabrics and weaves which reflect the story of their endeavor to live and breathe new life into their own traditions for centuries . The Guajarati women are strongly traditional when it comes to attire and today when we speak of Gujarati saree we form a picture that has been over years formed in our minds-the seedha palla clad , colorfully attired Gurjari who sees life through the kaleidoscope of many colors and hues. But the history of saree wearing in Gujarat is as diverse as it can get. 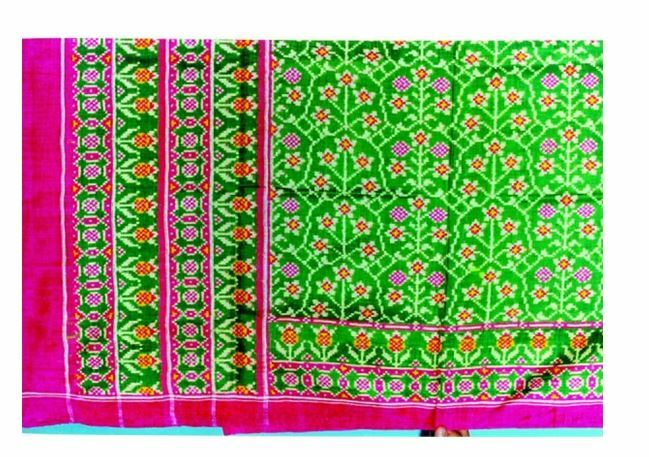 In each part of Gujarat, a different form of weaving and handwork has been assimilated into their sarees and thus their distinct styles . Here is a look at what a large culture scape opens up through a peep into History of Gujarat’s many sarees. 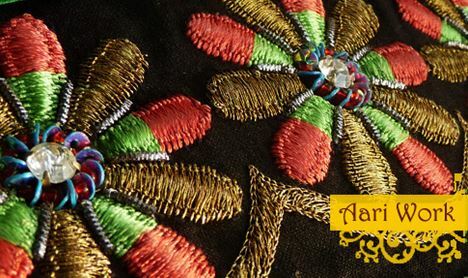 In the busy by lanes of Ahmadabad reside these family of few artisans who are the masters in the crafts of aari work embroidery. The sheen of resham, the glow of zari and they can create the most awe-inspiring pictures with their needle. This art had once been patronized by the royal family for their royal garments and today adorns some of the most sought after sarees from Gujarat. This is also alternately called as the embroidery art of Kasab. The royalty from the family of Banaskantha had invited these artisans centuries back to practice this art for them and this continues as their livelihood till date. About 100 such families in Ahmadabad practice this art even today. The fabric used is the local form of satin called as gajji-the stitch being somewhat like cobbler’s stitch –the motifs have been inspired from Persian with inclusion of many Indian forms as well. Typically the designs have to be first placed on butter paper and then on the wooden frame and then the fabric is worked on with copper and silver wires along with stones and tiny tinsel pieces to weave more magic into the art. The dense intricate design is painstakingly done with great care. Six to seven craftsmen are needed to begin working on one part of the saree. Brocade has been a part of the textile history of Gujarat for centuries, being practiced mainly in Patan, Bharuch, Surat, Vadodara amd Ahmadabad in particular. Apart from the fact that the Guajarati brocade continued to showcase the Krishna and Gopi motifs, the influence of the Mughal courts brought with it different Persian motifs of Jaal and jharokhas, seldom seen in their textiles before this. The brocade from Gujarat has a different kind of sheen, luster and thickness as compared to the brocade woven in different parts of India. It’s also called as the Ashavali brocade – a name derived from the old name of the city on which Ahmad Shah founded the new city of Ahmadabad. What makes this brocade so different is the backdrop of metallic hues that gives the colours an enameled look-very different from the brocade seen in Benaras. 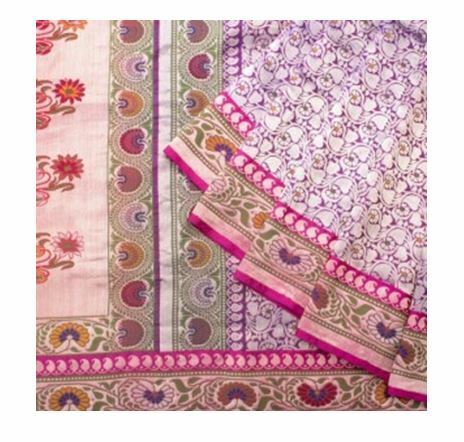 Also distinct is the tight weave of the border and the pallu-rich , varied and rare. The Ashavali brocade is also called as the ‘brocade of dreams’. The ghar chola is a combination of two words-ghar meaning –home and chola meaning the dress-but in the context of a wedding the meaning changes quite literally-the ghar in this case is the new home of the girl and the chola is the one that is the first auspicious gift the mother in law gives to the new daughter law of the family. Thus the very name of this saree suggests marital bliss and happiness. 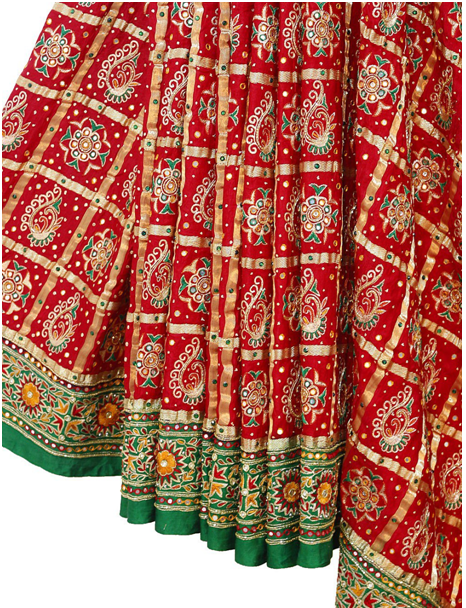 Considered staple in the Gujarati woman’s wardrobe, the colour are mainly those that are considered auspicious-red, maroons and yellow greens, of course. The design is in the typical zari checks and may be further embellished with stone work, and resham embroidery and even the use of cowrie shells that too are considered a sign of happiness. The Gharchola needs multiple tying and dyeing and this silks from the south maybe too soft and not as resilient as the gajji silk which is preferred for making these sarees. The fabric not only has to be tied and dyed but also woven with zari to create the famed grid and each of the grid then has to be embroidered further with unique motifs-more the embellishment more the value of this saree. Sometimes even extra borders called as brat is attached to the saree and a heavier embroidered pallu is attached to the original one to make the saree as decked up as possible. Both the Hindu and Jain communities wear Gharcholas in their weddings and the while reds are favorite but green too is preferred as the color suggests growth and prosperity. Perhaps the most prized embroidery technique that has been recognized for its intricacy, neatness, elegance and simplicity all rolled into one-the Parsi Gara work saree of course. It originally comes in through the land of the Parsees-Gujarat, and then traveled with them to the rest of India. The Perawanu is the ceremony when a girl turns into a woman and that is the first time that she wears a saree usuallly having the gara embroidery.The silhouette of the saree is very simple and that is its USP. 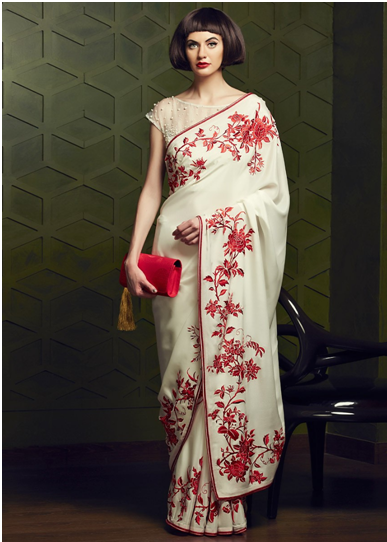 It’s in the influence of Chinese , Persian, Hindu and European motifs that one sees the multi culture impact and the way the community traveled from Bharuch to Kolkata, recreating as they went their style of embroidery. Today the Parsi Gara happens to be one of the finest finds in embroidered sarees in India-from flower baskets, to fish and peony, birds, butterflies and storks-all of them find expression through this exquisite needlework. 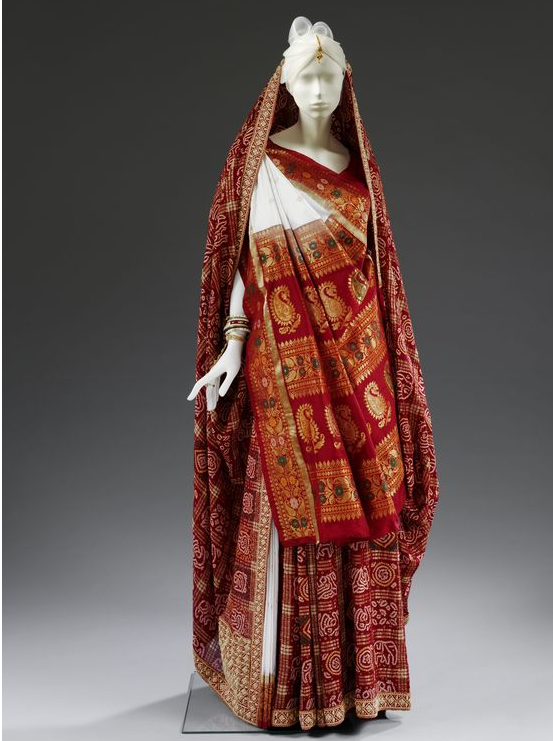 And finally the double Ikat weave for which Gujarat is most known for the patola saree. One of the most complicated of weaves which has a series of warp threads and single weft. As the threads are woven they are colored and tied in knots without the color allowed to run onto the next thread. Such is the richness of the saree because of this style of weaving that the effect is visible in the richness of color and texture. 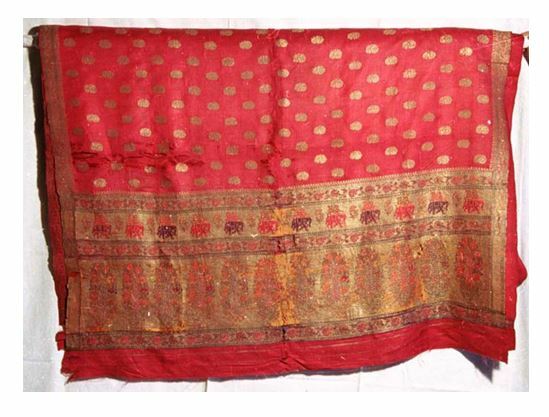 It is believed that there were 700 patola saree weaves in the settlement and they were patronized first by the Salvis and then the Solankis and so their fame and craft spread in its glory. Today the art of patola saree weaving in its original way is only followed but four families in Patan. The Salvi families take almost two years to complete the saree weaving as it is highly labor and time intensive. The cost therefore is also very high-not affordable by many. A cheaper variant of the Patan patola is the Rajkot patola –another kind of double ikat but in this case the weft is dyed and not the warp threads. 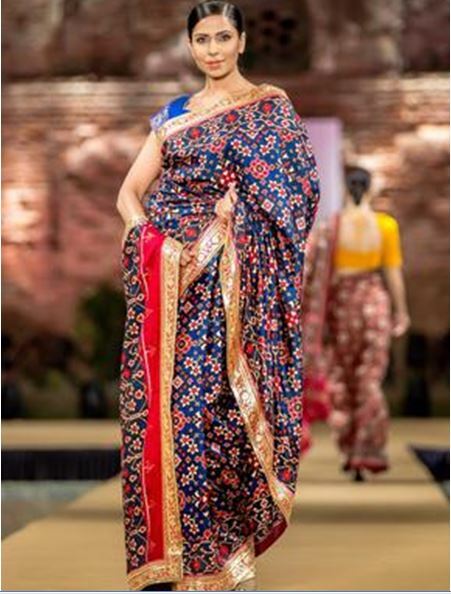 The saree tradition of Gujarat has given women a huge space of respect for not just the history of the weave but also the pride one should feel at the master weaves who have kept the traditions of weaving and embroidery alive.